Waste management is one of the best methods to clear the environment of pollution and contamination. However, most communities and municipalities send waste to different landfills, where a major part of this waste is left to react with the soil and environment; which can drastically affect the ecological system in the area. Residents in a particular community or municipality can contribute to the efforts of a government by selling recyclable scrap to different dealers in the market. This will not only ensure proper channelization of scrap, but will also bring extra monetary benefits to the residents. Wires and cables:Different types of wires and cables have various types of metal like aluminum, copper, and brass in them. These metal components can easily be separated with the help of recycling machines and equipments available with companies in the market like Northern California Compactors. Jars and utensils: There are many household utensils, cutlery, and jars that have a metal lining in them. Rather than throwing them away, you can easily sell these to a local recycler. Apart from this, various household utensils are made wholly of metals, which can easily be sold to the recyclers. Copper piping: This scrap is generally discarded at the time of renovations in the house. Water piping is the best place to find this scrap. Copper is one of the most sought after metals in the scrap industry; therefore, it should never reach a landfill. Various recyclers use different machines to manufacture products that can be reused again from this scrap. Electrical equipment: Washing machines, refrigerators, ovens, air conditioners, and other related electrical equipment should reach a recycler, rather than a landfill. The scrap derived from these appliances is used for making different types of metal sheets, which are further used to produce various types of metal components. Brass fixtures: This metal is usually found in different fixtures and electrical connections. When brass fixtures reach a recycler’s place, it is scraped to make different types of electrical wires and cables. After copper, brass is the next most sought after metal in the scrap market. Ferrous: Anything that contains a percentage of iron is a ferrous metal. Non-ferrous: This category includes all types of alloys that do not contain any iron. There are many people who get confused between ferrous and non-ferrous metals. The best way to find iron content in your metal scrap is by using a magnet. If the magnet sticks to the metal, then it has ferrous content in it. Although, this type of scrap is not that worthy, yet the recyclers accept it. If a metal scrap fails the magnet test, it does not contain any iron content. Therefore, it is an alloy, which is worthy in the recycling market. Copper: Copper is used in different electrical wires, cables, appliances, and equipment due to its high conducting properties. Brass: This metal is generally used in different door and bathroom fixtures. You can also find brass in keys, window linings, and artifacts. Steel: Being a universal metal, this is found everywhere around us. From household items to automobiles, steel has been dominating the market since its advent. Aluminum: You will find this metal on your window panes, cans, jars, doors, and many other related items. After steel, this is most sought after metal in the world. 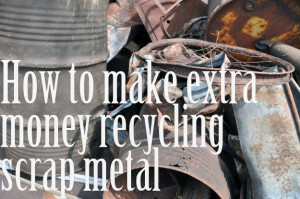 Metal scrap can fetch you a lot of money if you channelize it towards a recycler at the right time. It is advisable to research in a proper manner before doing so.